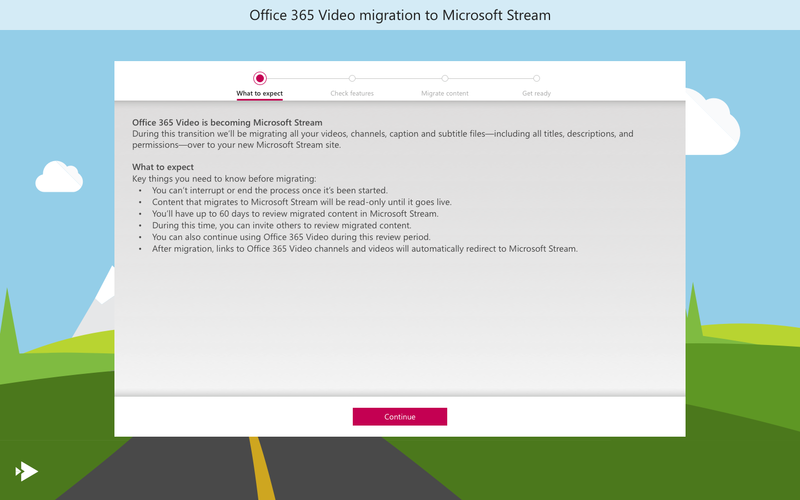 This topic explains how the transition of Office 365 Video to Microsoft Stream will work for your tenant, including the migration process and what to expect during and after migration. You need to be an Office 365 Video Admin to perform this operation. For more information, see Assign a user the admin role. 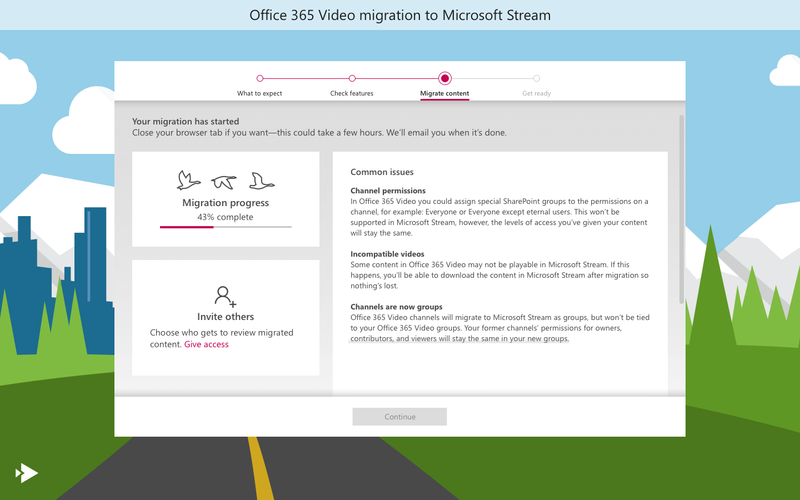 For general overview about Office 365 Video to Microsoft Stream transition, see Migrate from Office 365 Video. 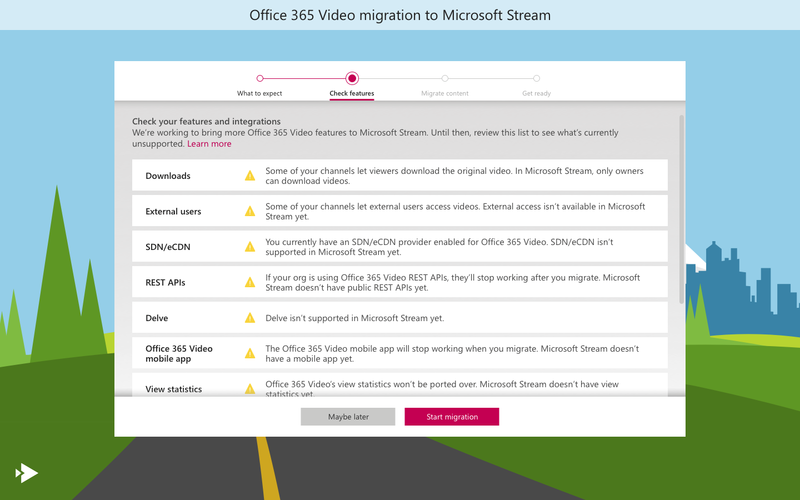 What gets migrated over from Office 365 Video to Stream? Office Video channels will get migrated as “Stream only” groups and these groups will retain the permissions of the Office Video channels. These “Stream only” groups will not create Office 365 Groups. “Stream only” groups are an entity only in Stream that allows the migration to copy the permissions one for one from Office 365 Video to Stream. Note, you will not be able to make new “Stream only” groups in Stream after the migration. What are the steps to migration? Make sure you are ready to migrate. Review the feature comparison and ensure you are okay with the difference between Stream and Office 365 Video. Make sure that your users are ready for the change over from Office 365 Video to Stream and that they understand the differences. 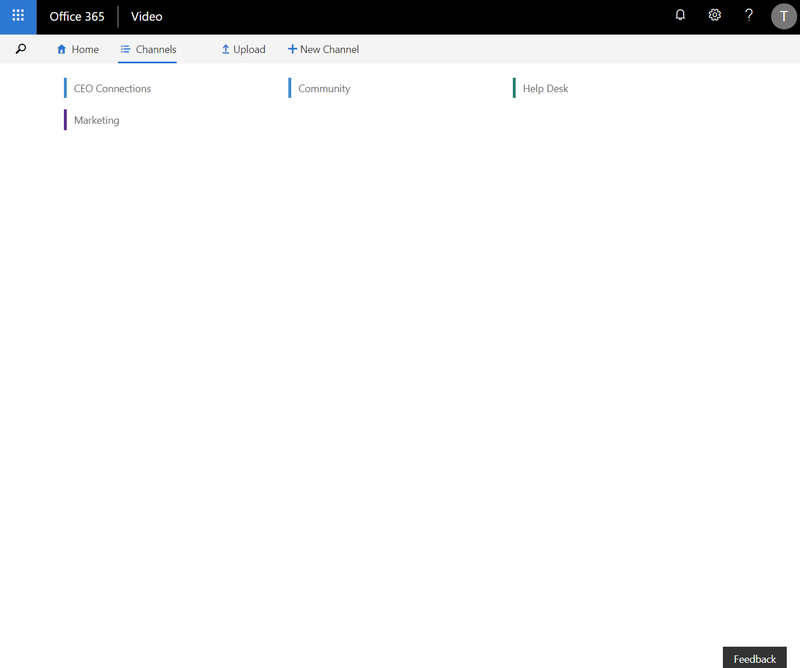 Any Office 365 Video channels will show up in Stream under “Groups” (not channels). 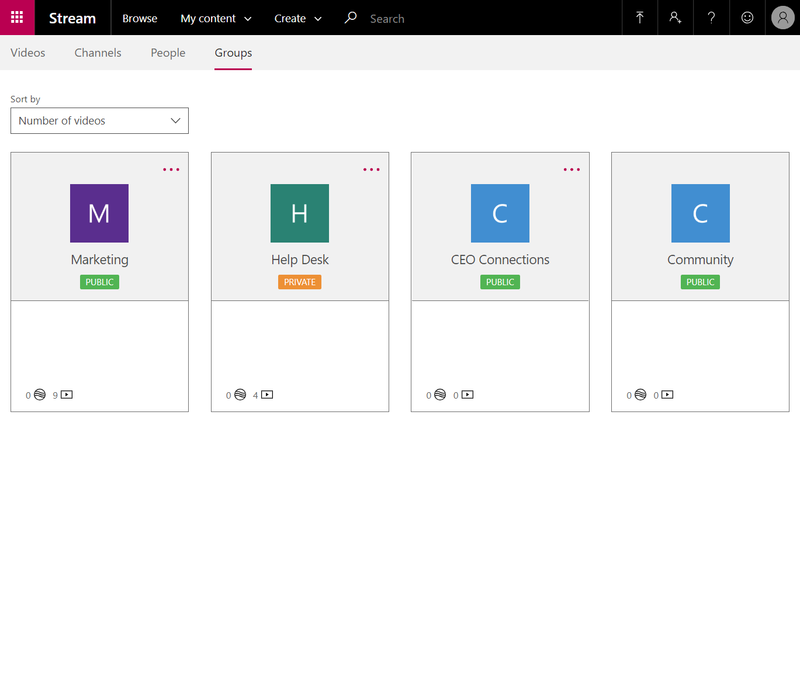 The Group concept in Stream matches what you could do at the Channel level in Office 365 Video. Your users won’t have to update any links or embed codes, those will automatically redirect to the new content in Stream after the migration is finalized. 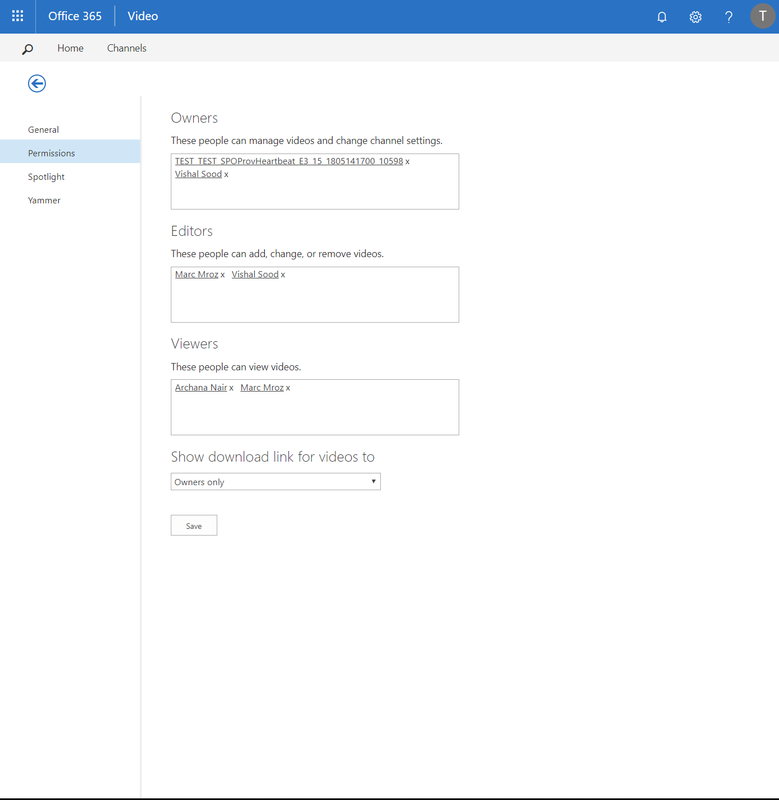 As an admin of Office 365 Video, when your tenant is eligible to migrate, you can click the banner at the top of Office 365 Video to go to the migration wizard. Step through the process and click Start migration to kick off the migration. All data is copied over from Office 365 Video to Stream and put in a hidden and read-only state in Stream. Only the Stream admins and users you’ve added to be a reviewer of the migration will able to see the read-only content in Stream. 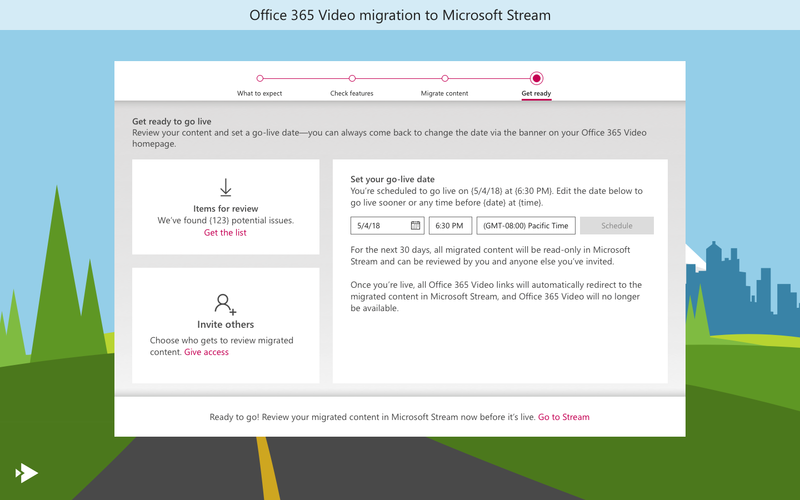 If you are already using Stream in parallel with Office 365 Video, users in Stream will continue to have access to Stream but will not be able to the see the migrated content. 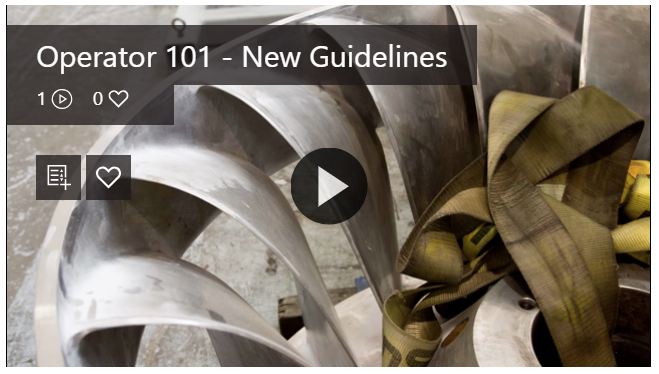 During this time any changes to Office 365 Video will be one way synced into Stream. You’ll have up to 60 days to review and verify your migration and make sure everything moved over properly. Have key content owners verify that everything looks good in Stream. If you notice something missing, incorrect, or wrong, please open a support ticket and our support team will help track down the issue. Depending on the circumstance our support team will be able to extend finalization dates accordingly. From the migration wizard, you can set a future date to finalize the migration. 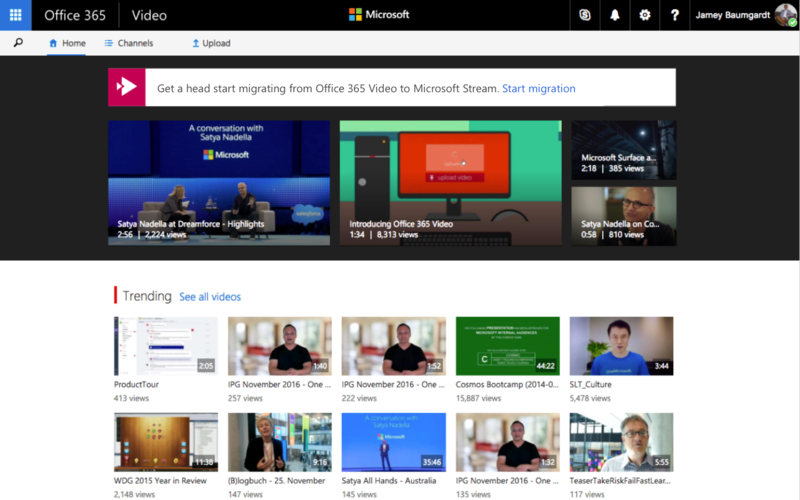 All Office 365 Video links will automatically redirect to the right videos, channels, and links in Microsoft Stream. All Office 365 Video embed codes which you have embedded on various locations will redirect to Stream. Office 365 Video is will not be accessible to any users. Office 365 Video content will automatically be deleted 30 days after migration is finalized. How can I initiate the migration and what’s the experience? You will land in the migration experience and here you will have information about what to expect during the migration. You can’t interrupt or end the migration after it has started. 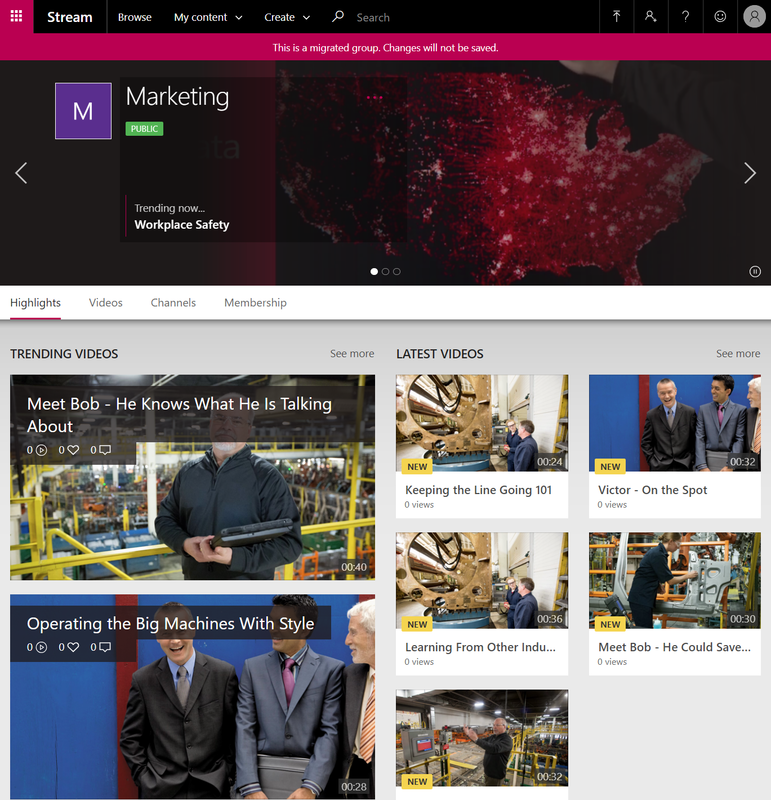 Content that gets migrated over to Microsoft Stream will remain read-only until you go live. A tenant has up to 60 days to review and verify the migrated content in Stream. During this verification phase, tenant admins can invite other content creators as ‘previewers’ to help review the migrated content. During this verification phase, you can continue to use Office 365 Video as your primary video portal. After migration is completed all Office 365 Video links and embed codes will automatically redirect to Microsoft Stream. At this point, we check your tenant and provide you some details about what features are actively used in your organization. There are features which we can’t detect with complete confidence so please review this list to initiate migration. Here is the list of feature comparison between Office 365 Video and Stream which should help you determine what’s critical for your organization. After we start the initial migration, we will continue to report migration progress as shown in the screen below. During this time, all data (including permissions) is copied over from Office Video to Stream. At this point, you can also invite other users in your organization to help review the migrated content after initial migration gets completed. We also provide an overview of some common issues which could come up such as incompatible videos between Office Video and Microsoft Stream. After the initial migration is complete, you can start your verification and by default all migrated content in Stream is read-only for 30 days which you can extend an additional 30 days. You cannot make any changes to the migrated content in Stream during this verification stage. Only Stream admins and the users you invited will see the migrated content. At this point, there is also a one-way sync happening from Office Video to Stream, so any changes which you make in Stream such as adding a new channel, uploading new videos or deleting existing videos, modifying permissions etc are automatically synced to Stream on a regular basis. There is no need for any additional actions which are required to migrate changes from Office Video to Stream. At this point, if you as tenant admins, go to Office Video, you will notice a banner on the home page that the go-live date has been set. You can click change date if you want to make any modifications to the go-live date. Before going live, we will also do a final sync to copy over any delta before finalizing the migration. All Office 365 Video links will automatically redirect to the corresponding videos in Microsoft Stream. 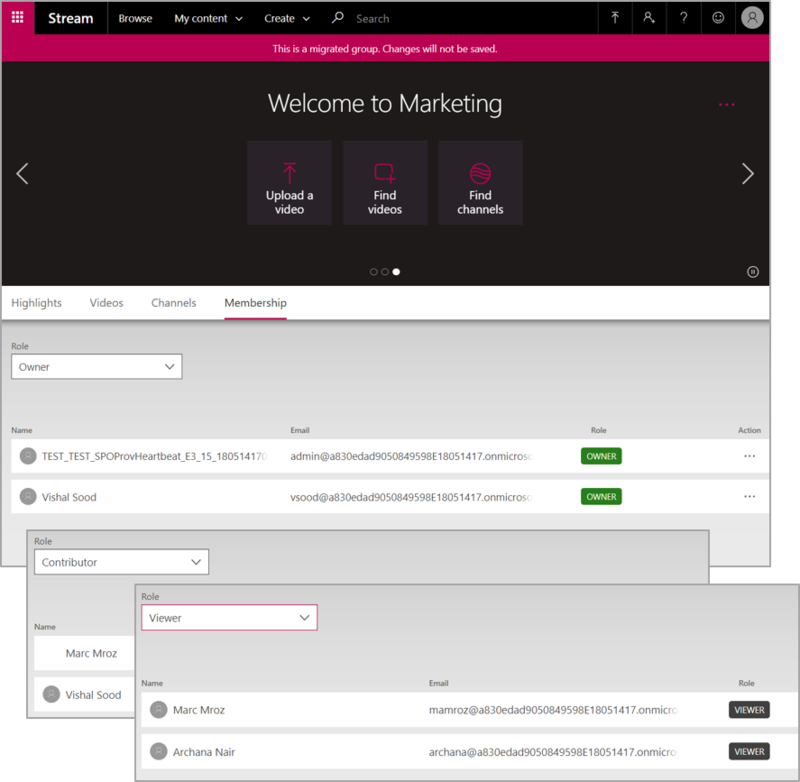 All Office 365 Video embed codes which you have embedded on various SharePoint sites or OneNote will redirect to Stream. Office 365 Video is will not be accessible to any users post go-live. Office 365 Video tile is removed from the Office 365 App launcher . How do you verify the migration before it’s finalized? Only the Stream admins and users on the migration reviewer list will see the migrated content in its read-only state in Stream before the migration is finalized. This will give that set of user’s time to verify everything looked good and moved over correctly. The videos from Office 365 Video showed up in Stream. The title and descriptions are accurate. Subtitles/closed captions are associated with the videos in Stream. The total view count came over for each video. When you edit the video permissions show the videos are owned the group (which was the Office 365 video channel). The Office 365 Video channels showed up as groups in Stream. 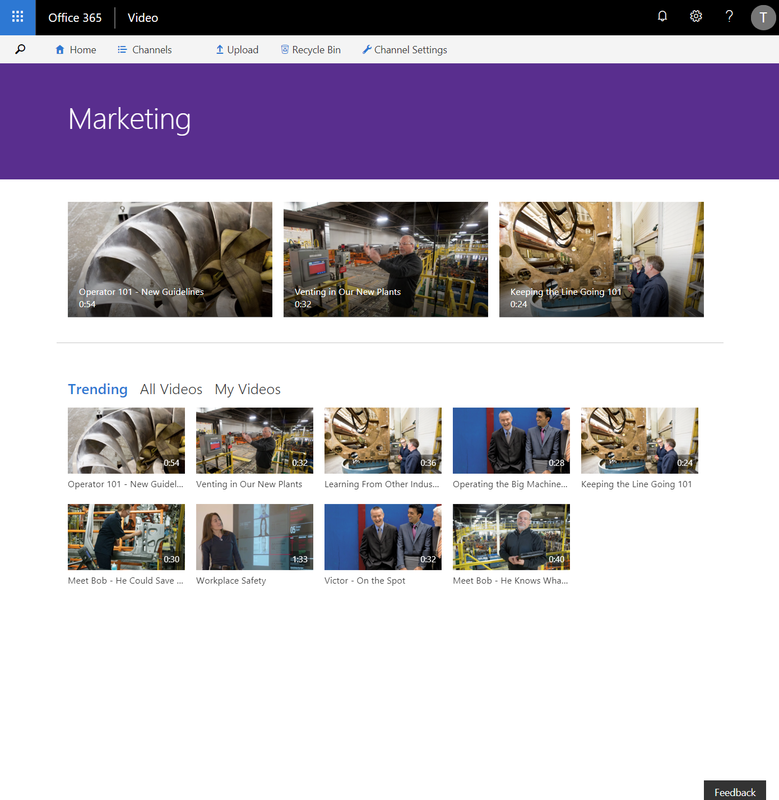 The videos inside the Office 365 Videos show up inside the corresponding group in Stream. The permissions set on the Office 365 Video channel got moved over to the Stream group including individual users and AD security groups. If the Office 365 Video channel had Everyone except external users set as viewers of the channel that the group settings in Stream has the group marked as a Public group. If the Office 365 Video channel had Everyone except external users set as editors of the channel that the group settings in Stream is has the group marked as “Allow everyone in the organization to contribute” to On. 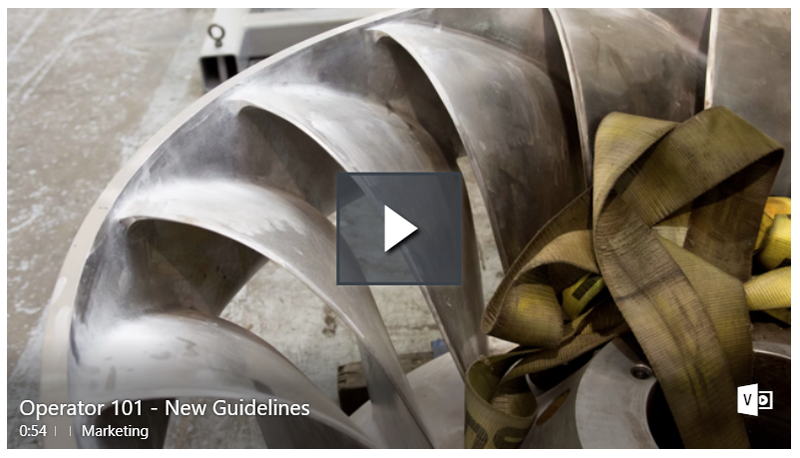 Users and security groups who were an Office 365 Video admin become Stream admins. Users and security groups who were channel creators in Office 365 Video are allowed to make companywide channels in Stream. The automatic redirection of Office 365 Video links and embed codes won’t happen during the verification / syncing step, this happens automatically after the migration is finalized. However during the verification step, you can test the redirection by adding &redirect=true to the end of an Office 365 Video link or embed code. What does my migrated experience look like? Migration to Stream only groups and navigating to the permissions pane shows the permissions copied over from Office Video to Stream. Post go-live, it will automatically redirect to Stream, and the display will be updated to showcase the Stream experience across all sites. NOTE: There is no action required from you to update the emded codes, redirection is automatic after going live. Also, there are no plans to stop this redirection any time in the future. What are "Stream only" groups? Stream-only groups are a new concept which we introduced with the migration from Office 365 Video to Stream. These groups live within Stream only and are not tied to Office 365 Groups, thus they don't create other resources in the rest of Office 365. Stream-only groups don't generate a team site in SharePoint, a plan in Planner, a team in Teams, or a group in Yammer, etc. Stream-only groups allow us to fully migrate an Office 365 Video channel into Stream and retain the full set of permissions. Stream-only groups have 3 permission roles – Owners, Contributors, and Viewers which maps exactly to the permission roles on a '‘Channel' in Office 365 Video. After you go-live with the migration to Stream, you can move content out from these Stream-only groups to other Office 365 Groups in Stream if you want to re-organize content in Stream. Can we create Stream-only groups from Microsoft Stream portal? If not, when is it coming? At this point, you cannot create a “Stream only” group from Microsoft Stream portal. The only way these kinds of groups can be created is via the migration from Office 365 Video. We are thinking about bringing this capability to Stream to allow a user to create a “Stream only” group or an Office 365 Group but we don’t have a definite timeline on when this feature will be available. If you had videos which were created by a user who is no longer with the company, after migration, all these videos will be assigned to Stream admin. Stream does not have the ability to edit the creator of the videos yet, so they will remain assigned to the Stream admin till we enable that capability. If you don’t prefer that, you can create a default user account and assign that as the only Stream admin for the duration of migration. After the initial migration is complete, you can add other users as Stream admin again. We cannot migrate channel by channel. The migration is run for all content in Office 365 Video.